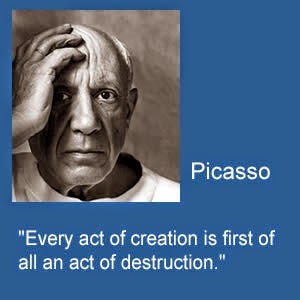 Picasso, at another time, put it this way: "Artists (and I will change that to creators) are "destroyers of nicely ordered systems." What could he mean by destroying “nicely ordered systems?” I believe he meant that the first nicely ordered system we must destroy is our own: the persona or the face that we show to the world. For our persona is not a reflection of our deep, inner or true self. Our persona is built by the dictates of the mind, not the dreams and truths of the heart and soul. Kathryn Hepburn said, "You cannot change the music of your soul." Those of us who can hear the music of our souls are lucky indeed. For to hear that music we must break down old barriers, the old ordered systems of our lives that keep everything neat, tidy and acceptable. There is nothing neat and tidy about creativity. You have to be willing to not only get your hands dirty, but also to slug through the mud, to bushwhack through unexplored back country, to dive into the chaos, and walk, run, fly, or crawl through all those unknown, unseen magical places where the music of the soul can be heard.